It's a natural. 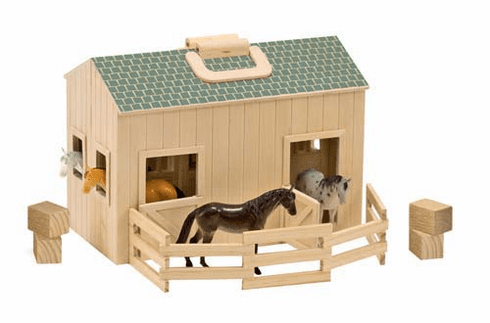 With a decorative green "shingled" roof, this wooden stable provides a happy home for 4 plastic horses. When open, your little farmer or equestrian has easy access to the hayloft, with its wooden ladder, and 4 bales of "hay". There's a stall for each horse, lots of sliding and swinging doors and a folding corral to keep the horses in the barnyard. Sturdy wooden handles make it easy to take the fun along.